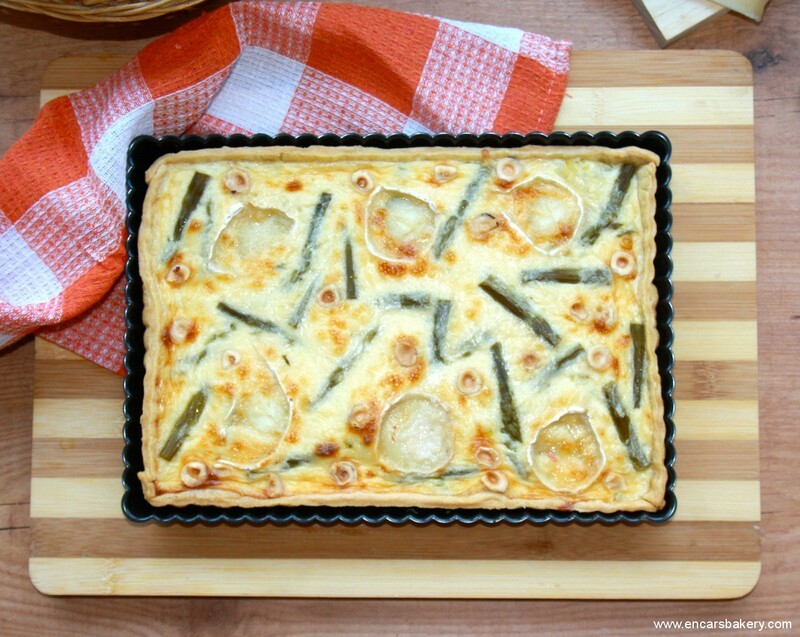 A few months ago I proposed this salty cake, and today I will tell you how to make a quiche, personally, I love it because of my weakness, already expressed in this blog, for cheese. 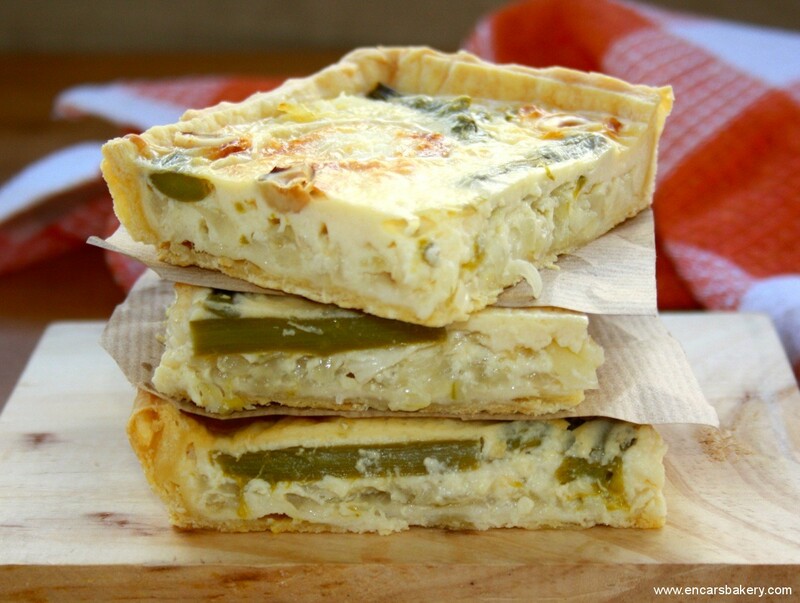 Thanks to the combination of flavors that bring, at the touch of hazelnuts ( a great discovery ) and the juiciness of the asparagus and onion, quiche is a delicious and ideal for summer dining, ¿Animals to prepararla? We let the dough thaw breeze and making a killing with it a cast of rectangualar 30 x 20 cm., or round 24 cm. in diameter. Preheat the oven to 180 º C. Mass punctured base, the cover with aluminum foil, cover it with dried beans and bake for about 15 minutes. Boil the asparagus 2-3 minutes, the drain them and cut into chunks (we'll skip this step if we use packaged). Chop the onions finely and pochamos in a pan with some oil, simmer, until tender and golden. We take the asparagus and hazelnuts, and mix. Tip the above mixture in the baked dough by spreading homongéneamente. We started in goat cheese slices and reserve 6 you 8. The rest I chop and whisk together with eggs, cream and cream cheese until well blended. Add the Parmesan and stir to mix. Salpimentamos to taste and cover the cake with the mixture. Placed over the slices of goat cheese reserved. 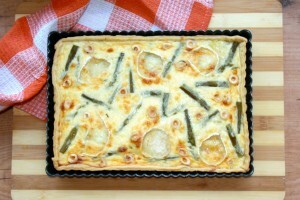 Bake the quiche, in preheated oven at 180 º C, during 15- 20 minutes, or until the filling begins to set. Once outside we can serve the cake warm or cold. I hope you enjoyed. After this paragraph salt, we soon prescription sweet.. See you soon !! Your presentations are salted to remove the hat also. It looks a creamy texture and a rich combination of cheeses well. Well, give me my weakness, pies and cheeses, with which I'm delighted. I like your cake and you copy it. But I am quite the opposite, I hate cheese, but I like how the dishes are of presence that will take, sure because the smell from this side of the screen, jajaa!! 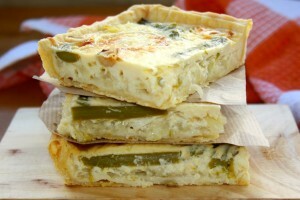 This quiche is great, mine with sour cream or cream!!! Ummmmmm… What a treat and what a beautiful quiche!. I love to eat in summer, there is not much gain (no time) prepared much more, truth?. Incarnate I love salty subsections, You have given me ideas for something practical and rich, also is perfect to let it done at night so when I get to eat at noon of the store and I have the food ready. Yummy, Encar, have given me an idea for lunch today I have a cheese that I have to spend and. Look where you, this quiche did not know, but scored me. Do not know if I like your recipes more sweet or savory recipes your…Vouchers “PA to”!!! I love! I think a great quiche, and it is best that I have almost all (including asparagus) I just need the goat cheese, but let me assure you that I think prove. Very appetizing Incarnation, in this weather so warm these recipes are a great! Terrific must be Encar! The cheeses me crazy and green asparagus….I'll take it! Besinos and happy summer! Wow he looks like the quiche Encar! I loved… and with so many cheeses, with what I like! Hey, I contest, apetece you PARTICIPATION? 're requeteinvitada! Encar, beautiful, I have this summer arrives with my blogs and yours very abandoned. Even so, I keep following you and I do not miss one of the delights you prepare. These quiches,for example, I loved. I am a total fan of this type of dishes you can stop and enjoy ntelación cona ready to go home and if the recipe above has better asparagus. BASIC beautiful. 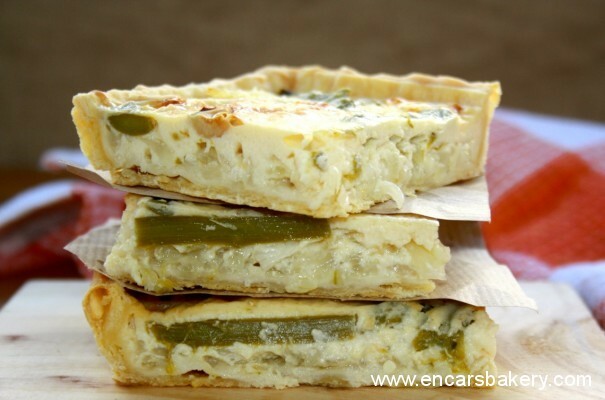 A quiche deliciosa, Encar. Sure the goat cheese gives it a delicious Dabor. I love wild asparagus, so it's the perfect combination. a kiss. Mmm, Why are delicious quiches! There is a Swiss dish prepared by my sister (“lauchwähe”) so that, with leek and cream, and can not believe that something so simple is so good.